A boy tries to overcome his fear of the sea in this treasured classic and winner of the Newbery Medal. Maftu was afraid of the sea. It had taken his mother when he was a baby, and it seemed to him that the sea gods sought vengeance at having been cheated of Mafatu. 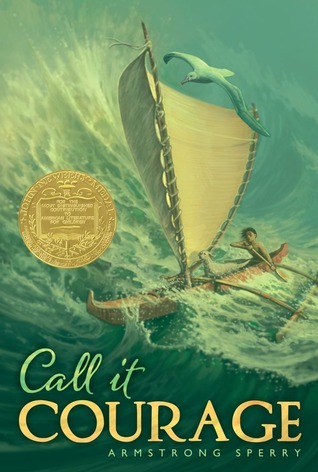 So, though he was the son of the Great Chief of Hikueru, a race of Polynesians who worshipped courage, and he A boy tries to overcome his fear of the sea in this treasured classic and winner of the Newbery Medal. Maftu was afraid of the sea. It had taken his mother when he was a baby, and it seemed to him that the sea gods sought vengeance at having been cheated of Mafatu. So, though he was the son of the Great Chief of Hikueru, a race of Polynesians who worshipped courage, and he was named Stout Heart, he feared and avoided tha sea, till everyone branded him a coward. When he could no longer bear their taunts and jibes, he determined to conquer that fear or be conquered-- so he went off in his canoe, alone except for his little dog and pet albatross. A storm gave him his first challenge. Then days on a desert island found him resourceful beyond his own expectation. This is the story of how his courage grew and how he finally returned home. This is a legend. It happened many years ago, but even today the people of Hikueru sing this story and tell it over their evening fires.